Knockan Crag is the site of a National Nature Reserve due to its importance in the development of modern geology. In the early 19th century, it was recognised that rocks could be lifted and tilted, but it was not believed they could move any great distance laterally. At Knockan Crag however, it was discovered that the rocks at the top of the cliff (Moine Schist) appeared to be much younger than the Durness limestone at the bottom. Some geologists argued that the ages assigned to the rocks must be wrong, until geologists Ben Peach and John Horne showed that the anomaly was caused by the Moine thrust, which had pushed the younger Moine Schist rocks some 70 miles westward, riding up over the top of the older rocks below. Knockan Crag was the first thrust fault to be recognised in the world – a discovery that paved the way for plate tectonics and modern geology. 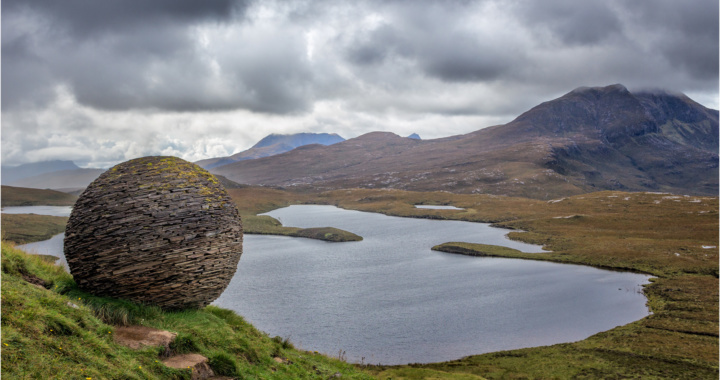 There is a visitor centre and a network of short interpretive paths at the crag, but the main photographic interest lies in several rock sculptures and the superb views of the Inverpollaidh Forest available from the top of the crag. Ben Mor Coigach, Stac Pollaidh, Cul Mor and Suilven are all prominent in the views. Knockan Crag lies on the main A835 road, 12 miles north of Ullapool. There is a car park at the visitor centre, and several interpretive loop paths of varying length. The Crag Top trail climbs to the top of Knockan Crag for the best views. Posted in Scotland and tagged Mountain, Historical.